Nicknamed “DJ” Fontana was employed by the Louisiana Hayride to be an in-house drummer on its Saturday night radio broadcast. 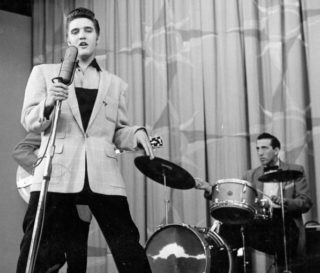 In October 1954 he was hired to play drums for anew singer called Elvis Presley. That marked the beginning of a fifteen-year relationship. He performed with Elvis, Scotty Moore and Charlie Hodges in the round on the NBC television Special better known as the ’68 Comeback Special. 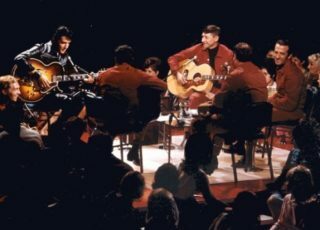 DJ Fontana joined a band (originally assembled by Sam Phillips without a drummer) consisting of Scotty Moore (lead guitar), Bill Black (bass) and Elvis Presley (rhythm guitar), calling themselves “The Blue Moon Boys”. This became the band that would perform and record the vast majority of the Elvis Presley hits of the 1950s (some also including piano and backing vocals from the Jordanaires) including “Heartbreak Hotel”, “Hound Dog”, “Don’t Be Cruel”, and “Jailhouse Rock”. The band also toured extensively and performed on several television appearances including The Ed Sullivan Show through 1956 and 1957. Just like the other members of Elvis Presley’s band, DJ Fontana was inducted into the Rock ‘n’ Roll and the Rockabilly Halls of Fame. During Elvis Week 2016, he was surprised with a Beale Street Brass Note. These notes line Beale Street as part of the Beale Street Brass Note Walk of Fame. August 15, 2016 DJ Fontana was honored with Beale Street Brass Notes Walk of Fame: an offer awarded to the many talented people who had put Memphis music and Beale Street on the world map. 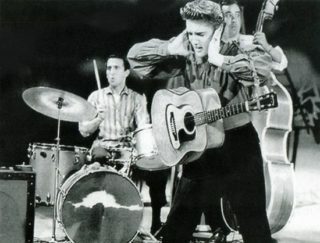 Note Number 153 DJ Fontana (1931-2018) Drummer DJ Fontana along with Bill Black and Scotty Moore formed the fantastic combo behind Elvis. Fontana performed with Elvis for 16 years. The band officially broke up in 1958 although Fontana and Elvis still played and recorded together regularly throughout the 1960s. Moore would sometimes join them. Moore and Fontana have also performed together without Presley, including a 2002 recording of “That’s All Right (Mama) with Paul McCartney. After 1958, Black never played with the band again; he died in 1965. 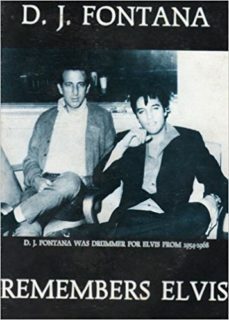 In 1983, Fontana published a book in pictorial form titled D. J. Fontana Remembers Elvis about his years playing with Presley.